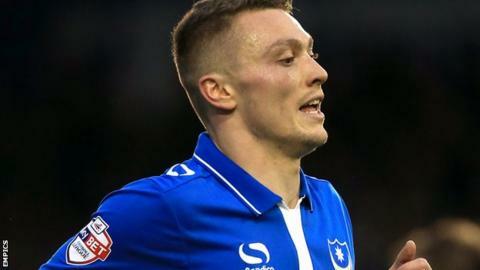 Portsmouth striker Caolan Lavery is enjoying building a partnership with fellow loanee forward Marc McNulty. Lavery and McNulty have scored six goals between them in Pompey's last three games with Paul Cook's side undefeated in the last five games. The pair, on loan from Sheffield Wednesday and Sheffield United respectively, combined for a goal for Lavery at Wycombe on Saturday. "That's what partnerships are all about," Lavery told BBC Radio Solent. "Lots of respect to Marc, because he could've gone on and taken the goal himself as he's in such good form. "He was unselfish and hopefully that partnership we're building will continue to develop." Lavery, 23, showed his admiration for McNulty, also 23, just days after the Scottish striker netted a hat-trick against York. "The more games we play together, the better the chemistry," Lavery added. "Luckily, so far we've shown we can score the goals. "But, there's lots of players behind us in the pecking order who are all very good players, so we need to keep doing what we can."